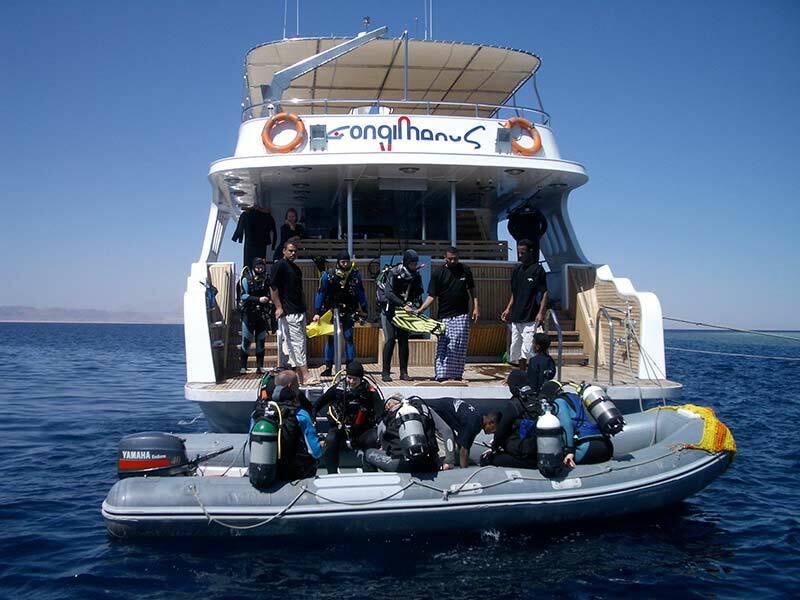 Far beyond the mainland, diving down into the depth of the Red Sea, we offer not only unforgettable dive adventures, but also a first class service on our dive cruise ship M/Y Longimanus. Get spoiled by the professional crew who give their best to make your vacation a very special one. Building this ship was one of Mahmoud Abd El Hadys (owner of the Barakuda Diving Centers Lahami Bay &Lotus Bay,) youth dreams. The Longimanus was built in Suez and completed in 2003 in Safaga. The M/Y Longimanus, a boat from divers for divers, was especially designed and built for highly challenging dive safaris. On board the 36m long wooden yacht you will find the latest in diving and safety equipment, with which we set new s tandards for dive cruise. Two powerful engines bring you to the most remote dive sites in no time at all. Width and layout allow a smooth and comfortable trip even in rough waters. Our boat, the kitchen crews’ service, and the freshly prepared meals do not have to fear being compared to a luxury hotel. The Longimanus Crew along side captain Ahmed are at least 10 and is among the best crews in the Red Sea. Languages on board are English and Arabic. Our guides are happy to help with possible language difficulties and are always there for you in case you have any questions. 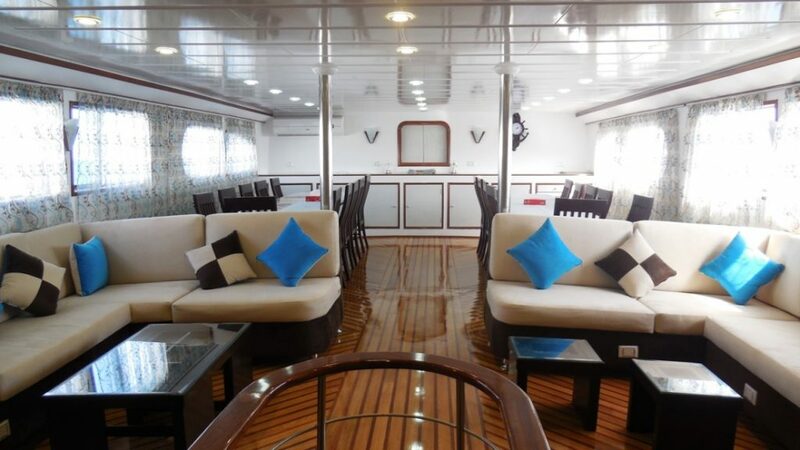 The Longimanus has 8 spacious double cabins on the lower deck and 2 suites with queen size beds on the upper deck. Every cabin is equipped with a shower / toilet, towels and bath robes, music channel, mini bar and individually regulated air condition. Full board includes 3 main meals per day (breakfast, lunch and dinner) in buffet style. Between your dives the crew serves snacks, water,softdrinks, tea , coffee and fruit assortments for free, as well as post-mix drinks during meals. Alcoholic beverages are not included and will be charged at the end of the tour. The fully air conditioned salon, equipped with the most modern entertainment system such as DVD player, 60 inch Plasma TV and a Dolby Surround System invites you to enjoy the good atmosphere. The crew serves cold drinks at the bar. The diving deck with 2 fresh water showers has enough space for your equipment. We have plenty of lockers on deck for you which have power plugs where you can charge your camera or diving torches. On the sundecks you can find a place to rest, relax and recover; after sunset you can admire the beautiful starry sky while you reminisce about the past day over a shisha. The deck as well as the furniture are teak.